Preaching may be easy for some but it’s not for me. In fact, there are days scattered throughout the year when my disappointment gets the best of me and I consider leaving the pulpit altogether. I’m sure there’s probably a broken part of me still tied to performance and merit-based living which the Gospel freed me from that whispers in my ear, “Yancey, if this is the best sermon you can muster on a weekly basis then you need a new seat on the church bus.” Granted, I don’t hear that voice often but it has stayed with me long enough to cause me to look upon my teaching ministry with great caution and reservation. I’m sure some of my issues flow from the fact that preaching is much more an intuitive than systematic process for me. Every so often I’m asked by pastors in other churches about how I put together a message and almost always I’m embarassed to reply because of my inability to share with them point-by-point how it happens. The reason for that is it looks different almost every time: sometimes I start breaking down a text on paper, or I brainstorm the flow of an idea on a marker board, or I research for a period of time and then write the sermon from start to finish! Now think about that, in my ten (almost eleven) year tenure as the teaching pastor of my local church I’ve likely preached upwards of around 500 sermons. One would think I’d have a rock-solid process of message preparation by now but I don’t. That’s nuts! Frankly, it bothers me that’s the case. I must say, this angst in my preaching is completely internal. There is not a week that goes by where I don’t have several encouraging, uplifting emails filling my inbox about how God has used my latest message in the lives of my parishioners. I am grateful for that. Indeed, I rarely delete any of them. Furthermore, I’m a part of a leadership staff which reinforces my teaching gift with similar votes of confidence and support. That’s a big deal to me as well. I tend to give a louder voice in my life to those whom I deeply respect and there are fewer men I respect as much as those who comprise our Executive Staff. Make no mistake, my struggle with preaching is one where I’m in a room locked from the inside. In the end, I believe I should receive my preaching insecurities as more blessing than curse. Phillips Brooks, who taught a course of lectures on preaching at Yale University in 1877, counseled young pastors, “Never allow yourself to feel equal to your work. If you ever find that spirit growing on you, be afraid. 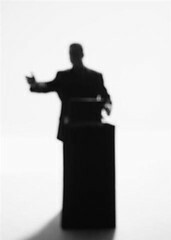 (Lectures on Preaching, 106)” Thankfully, I don’t believe that has ever been the case with me. So, I will continue with preparing messages in a fashion that bewilders even me. I’ll still keep walking to the pulpit with great unease and uncertainty. And I’ll still continue, God-willing, to deliver another 500+ sermons over the next decade. However, I pray I will do it all with an ever-deepening, always abounding faith that God is doing the work I can’t and very thankful he chooses to use people who are limited, if not broken, for his glory. If it isn’t broke then don’t try and fix it. Ever week I look foward to hearing the sermon you have prepared. You have a unique way of preaching that I have never heard before. You preach with conviction and everyone can see your passion and your love for Christ!!! You are one of God’s many tools and I thank him for allowing me to hear his word through you. Whatever you do to prepare for teaching I hope you don’t change a thing… even if it frustrates you. He then asked who should do it? Well Yancey of course…. Those that are gifted in any arena will always feel like they have more to give and could have done a better job. I think your intuitive approach is actually a blessing. You are excellent at what you do and part of this is because it seems to come out completely naturally. There is nothing predictable about your messages and teaching style other than at some point in time, you’ll explain how it connects to the gospel. We are blessed to have a teaching pastor as capable as you. God has equipped you with the wonderful gift of teaching from His word. I’m glad that you recognize your reliance on God and that it is truly He who is doing the work. I’m also glad that our congregation is blessed with someone who teaches as effectively as you.